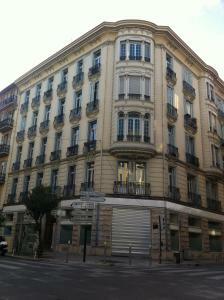 Maison Bonfils is situated in the city centre of Nice, 150 metres from the SNCF Train Station. Free Wi-Fi access and a flat-screen TV are provided in the spacious guest rooms. Each of the guest rooms at Maison Bonfils features a balcony and is decorated in warm colours. Guests have access to shared toilets and a hairdryer is provided. Every morning a continental breakfast is served and there are many bars and cafes nearby. Maison Bonfils is set in a 20th-century building, located a 15-minute walk from the Promenade des Anglais and the beaches. An airport shuttle service is provided at an additional cost.